Given that the primary use of any mobile phone is to text message and call others, we tend to do both of these things very frequently. As a result, a lot of your iPhone's storage may be filled with text messages and by learning how to delete individual messages on iPhone iOS 12, you can free up some of that storage. 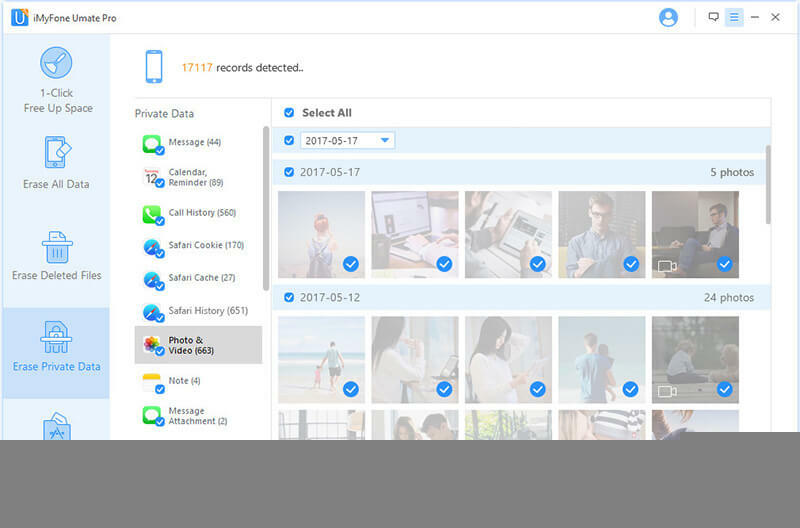 When it comes to deleting text messages on iPhone iOS 12, the best program that you can use to manage them is iMyFone Umate Pro. On top of being able to use this program to delete your text messages, you can use it to gain access to the features below. Selectively delete your text messages or all at once. Scan and wipe data that you had previously deleted from your iPhone. Permanently erase any type of data from your iPhone. Preview data before you erase it from your iPhone. One-click free up space feature removes unnecessary files. 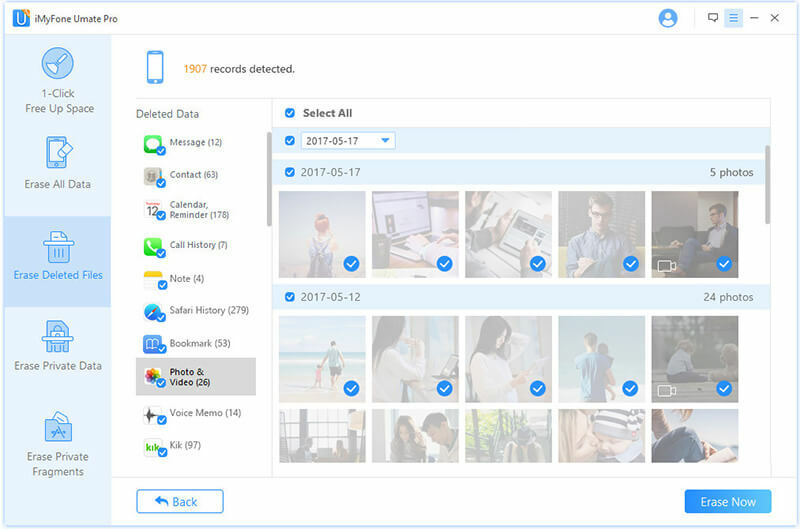 As well as these features, there are a lot of other features included in iMyFone Umate Pro which allow you to get the most out of your iPhone's storage. Below we are going to show you how to delete individual messages on iPhone iOS 12 or all at once using iMyFone Umate Pro – so, lets jump right in. Step 1. Start by running iMyFone Umate Pro on your computer and connect your iPhone. Step 2. 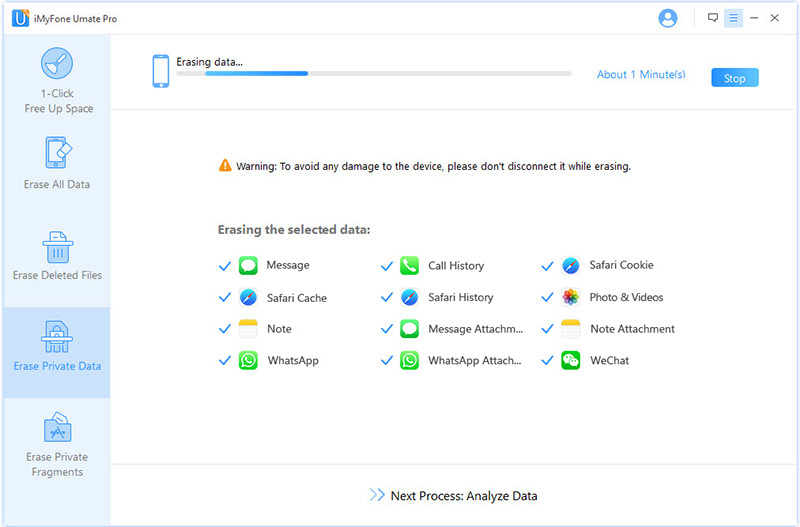 From the left menu, click on the "Erase Private Data" feature. You will be shown some brief information about the process and your device; click on "Scan" to proceed. Step 3. Your iPhone will be scanned to detect all of the personal data that is stored on it. Once the scan is complete, click on "Message" and select the text messages that you want to have erased. Step 4. Lastly, after all of the text messages that you want to delete have been selected, click on the "Erase Now" button. This is the most effective way that you can learn how to delete all messages on iPhone permanently. On the other hand, there are iOS features which can be used to show you how to delete all messages on iPhone as well as individual messages. Below, we're going to show you how to do both of these, starting with deleting all of your iPhone messages. Step 1. Unlock your iPhone and go to the "Settings" app. Step 2. Swipe down and tap on "Messages" followed by "Keep Messages". Step 3. Select either "30 Days" or "1 Year". There will be a pop-up window: Delete Older Messages? Step 4. Tap on Delete, then all of your text messages will be deleted after the set time. 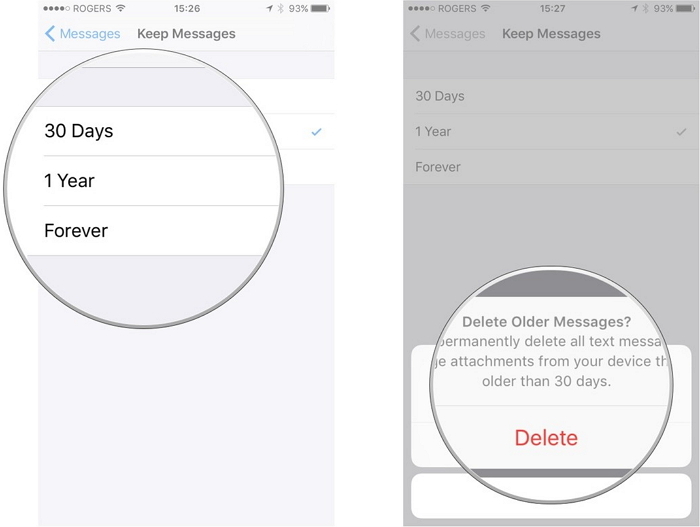 This will help you to delete all text messages on iPhone after a certain amount of time and if you change this setting to 30 days, any text messages from before that time will be deleted. To delete individual text messages on iPhone, follow the steps below. Step 1. Unlock your iPhone and open the "Messages" app. Step 2. Swipe down the list of chats and tap on the one that you want to selectively delete text messages from. Step 3. Tap and hold one of the messages that you want to delete, then tap on "More…". Step 4. Now, select all of the messages that you want to delete. Step 5. Once you have all of them selected, tap on the trash icon and then on "Delete Messages". While these two methods may be more convenient than connecting your iPhone to a computer, there are several disadvantages to them. 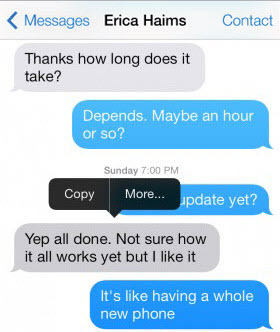 Manually deleting your text messages is very time-consuming. Any manually deleted text messages can be recovered. Deleting text messages on a smaller screen makes the task more tedious. However, if you'd prefer this method, we highly recommend that you use iMyFone Umate Pro to permanently delete the text messages afterwards. With the help of iMyFone Umate Pro, we're going to show you how to delete individual/all messages on iPhone after you have manually deleted them so that they can't be recovered. Step 1. From the menu on the left, click on "Erase Deleted Files" and click on the "Scan" button to begin. Your iPhone will now be scanned - this should only take a few minutes. Step 2. Once the scan is complete, you will be shown all of the deleted data that is stored on your iPhone. Click on "Message" and select any of the deleted messages that you want to wipe. Step 4. Lastly, click on the "Erase Now" button and after a few seconds, your messages will be permanently deleted. If you have manually deleted text messages on iPhone, then doing this is essential to making sure that they can't be recovered. The downside to using built-in iOS features for deleting text messages is that they can still be recovered. 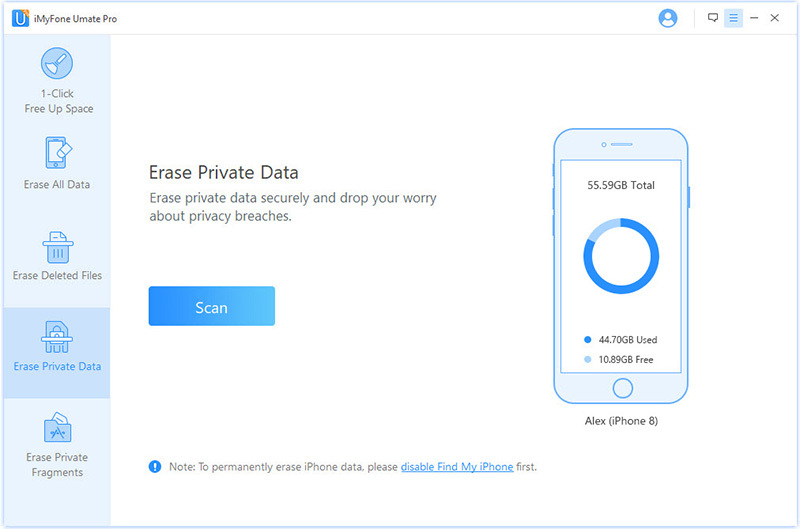 On top of that, you can use iMyFone Umate Pro to permanently erase all iOS data so that when you're selling an iPhone, you don't have to worry about your personal data falling into the wrong hands.